The second American Express ‘All for Dub Nation’ Watch Party has tickets available now. Golden State Warriors fans in the Bay Area will once again get together on Thursday, February 23, 2017 to be part of this exclusive opportunity for AMEX Card Members to rally and cheer on the NBA team with the best record as they take on Western Conference division rivals the Los Angeles Clippers to begin the second half of the season. The NBA All-Star Game is happening this weekend at Smoothie King Center in New Orleans on Sunday, February 19, 8:00 PM, broadcasting on TNT. The Sports Techie blog anticipates high scoring affairs for the All-Star Game and Warriors versus Clippers. 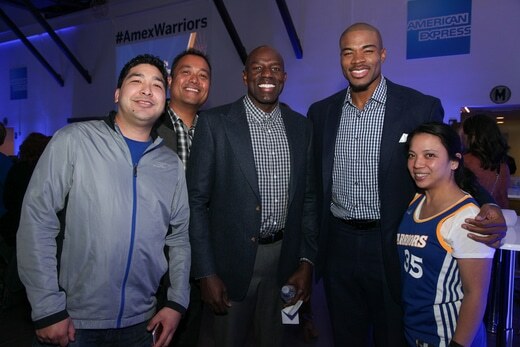 American Express Warriors Watch Party – Tickets Available Today. 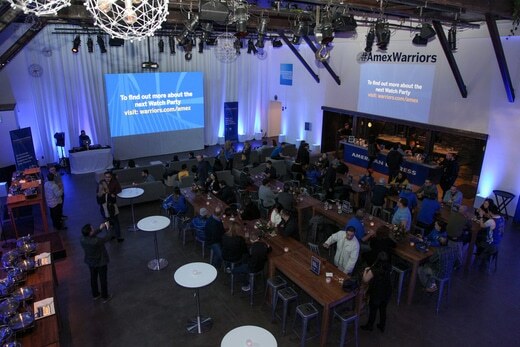 This innovative series began on January 16, 2017 when Warriors fans gathered at the top secret location, the Pearl in San Francisco for the first ever American Express “All for Dub Nation” Watch Party. Card Members can now purchase tickets ($25 each) via Resy starting with limited availability (must be age 21+ to attend). 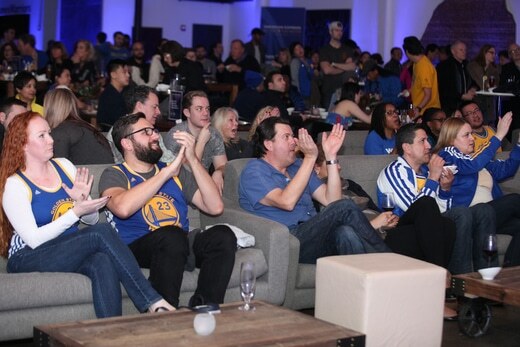 The ‘All for Dub Nation’ Watch Parties continue the trend of unique events and activities from American Express and the Warriors this season. 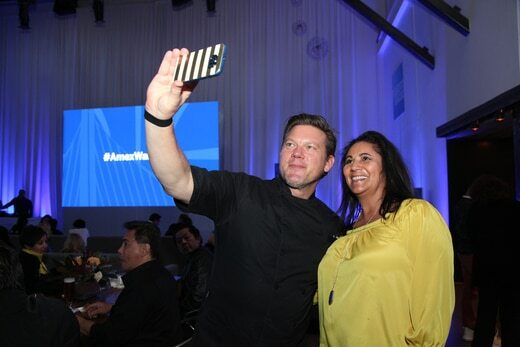 American Express has a long history of bringing its Card Members closer to their favorite teams, and as the official card of the Golden State Warriors, American Express is excited to create some unforgettable experiences for Dub Nation again this season. Sports Techie, I watched the Warriors and Oklahoma City Thunder match up on TV last Saturday night. As a lifelong Seattle SuperSonics fan it was bittersweet watching and hearing the reaction too many OKC fans gave KD knowing the team was high-jacketed in the first place. It was a treat to watch Kevin Durant show his human side and superhero performance throughout the one-sided game during play and especially at the post-game interview where he showed a ton of class. KD’s Mom was upset by the local fans reactions and classless verbal attacks by visibly upset fans that he left town for greener pastures in Oakland. Cry me a river say Sonics fans. The game was a homecoming for Durant after he left OKC during the off-season to sign with the new super team villains led by All-Stars KD, Stephen Curry, Klay Thompson and Draymond Green. NBA Saturday Primetime on ABC claimed a 4.1 metered market rating. These telling metrics made it the highest-rated, non-Christmas NBA regular-season game on any network since 2013 as determined by Nielsen viewing numbers. The average per minute audience of 80,000 viewers, on top of 320,000 unique viewers and 13.8 million total minutes streamed is a sign of the robust digital times for the NBA, ESPN (Disney) and Turner Sports business trifecta. Be sure to tune into the complete schedule of hoops events for NBA All-Star 2017 featuring the 66th All Star Game. On Saturday at 2:30 p.m. fans can watch the NBA D-League All-Star Game presented by Kumho Tire on NBA TV. Today, the NBA announced that the D-League is now sponsored by Gatorade and known as the G-League. Several nights ago Dub Nation helped the Santa Cruz Warriors set a new single game D-League attendance record with 17,497 for the first-ever NBA minor league basketball game at Oracle Arena. You have to admit, the Warriors are en fuego with an assortment of novel fan experience activations, with and without technology. Enjoy the the second American Express All for Dub Nation Watch Party between SF and LA teams representing northern California and So Cal. Sports tech in the Bay Area is a way on life, ask KD, AMEX and Dub Nation.